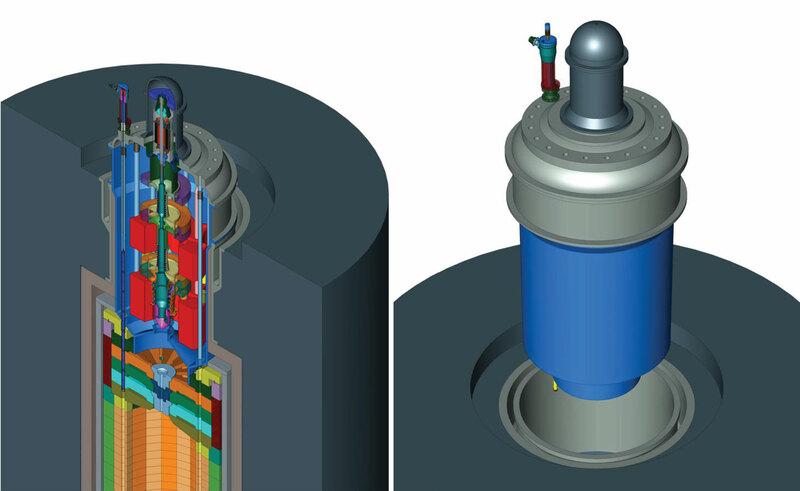 This article outlines Eskom’s approach in the development of the advanced high temperature reactor (AHTR) programme, commonly known as the pebble bed modular reactor (PBMR) restart. The proposed AHTRs are intrinsically safe, modular, efficient and modern gas-cooled reactors which are deployable in even the remotest areas of the country. The technology base for these reactors, although in research stage, is relatively established with potential commercialisation within the next few decades. Eskom’s approach is to develop a 100 MWth/50 MWe “proof of concept” machine, based on the key lessons from the PBMR, with energy storage capability tailored to customer needs. The research effort is primarily hinged on the PBMR technology with advances in Generation IV reactors. The South African energy policy stipulates the diversification of energy sources to meet the future demand for electricity . The energy mix includes nuclear power sourced from a pressurised water reactor (PWR), similar to those at the Koeberg power station, and PBMR-based approaches. Eskom has embarked on an initiative to explore the feasibility for the development of AHTR based on the PBMR programme that has been in a state of “care and maintenance” since 2010. The programme is being launched as a research initiative through the Eskom’s research, test and development group, in collaboration with academic and research institutions. The original PBMR programme was based on an industrially demonstrated German AVR design for high temperature gas cooled reactors . The demonstration module for this technology operated for over 20 years. Due to non-technical reasons, it was discontinued prior to commercial deployment. The PBMR business case developed in 2002, based on the 400 MWth design, showed a significant international market potential. The South African approach to the deployment of the PBMR was to avoid any fundamentally new technologies, while confirming the German results and focused therefore directly on a demonstration plant, which essentially would be a commercial design. The effort also resulted in minor modifications of the original design, most specifically in the power conversion and main supporting systems . The programme confirmed that South Africa can manufacture fuel to the required specifications at the Nuclear Energy Council of South Africa’s (NECSA’s) Pelindaba site. This fuel is undergoing post irradiation testing at the Idaho National Laboratories (INL) in the US, where preliminary results show good performance. As a result, there seems to be great potential to continue with further development of the fuel for the AHTR at NECSA. Fig. 1: Migration model . Fig. 1 provides the symptomatic technological evolution of the classical high temperature reactor (HTR), such as the PBMR, as predicted in the early 2000s. Due to existing knowledge at the time, the technology threshold for the HTRs was limited to 400 MWth at 9500°C . 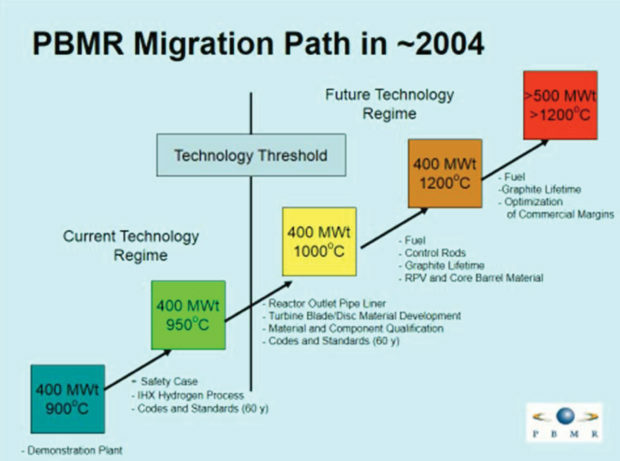 The threshold in the migration path envisaged for PBMR in 2004 has since moved to such an extent that many solutions then foreseen as part of the future technology regime are now ready for exploration. Whereas some of the technology improvement enablers have been demonstrated already, more research may be required for applications anticipated by the AHTR design. Academic institutions primarily support this programme and facilitate research work through the South African Nuclear Engineering, Science and Technology (SANEST) as a collaboration forum. The development of the AHTR concept hinges on the lessons learnt in the PBMR programme, developments in the HTGRs and what is deemed academically feasible. The overall objective is to attain suitable design of nuclear reactors for the grid demands of the future. Provide better economics with respect to costs and efficiency. The current configuration of the AHTR concept, as depicted in Fig. 2 is based on the proposed concept with direct helium Bryton cycle, molten salt (MS) storage, steam turbine (ST) and drying cooling tower. Fig. 2: AHTR process diagram. Fig. 2 depicts the AHTR concept, which is a combined cycle plant consisting of a top-end direct helium Brayton cycle and a bottom-end steam turbine cycle. 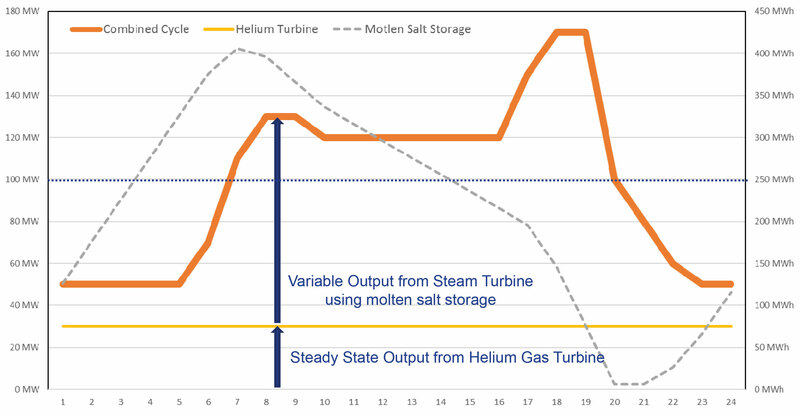 The top-end cycle consists of a high speed gas turbine-compressor-generator shaft unit with pre- and intermediate helium-to-molten salt heat exchangers. The generator is of a permanent magnet type. This unit rotates at speeds in the order of 20 000 to 30 000 rpm. The design includes a frequency conversion for compatibility with the South African grid requirements. The reactor operates at a constant full power level while the top-end cycle produces constant power to the grid. This is the so called base-load function of the plant. Any excess energy is removed through the helium-to-molten salt heat exchanger at a relatively high temperature and stored in a molten salt hot tank. This tank is located near the bottom-end cycle plant, far from the reactor unit complex. 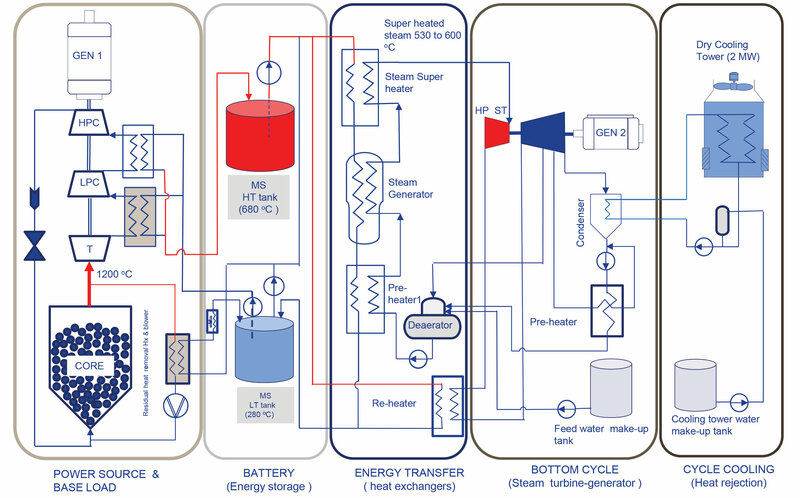 The bottom-end cycle consists of a steam producing section and a steam turbine-generator set. The heat from the hot MS tank is converted into steam in the steam generation section of the bottom-end plant. It may be a single steam generator unit or different heat exchangers with a steam drum. The returned MS is stored in a cold MS tank. Cold MS is pumped from this tank to the reactor unit to be heated. Fig. 3: AHTR demand profile. The high pressure steam is now routed to a high pressure steam turbine, reheated by the MS and fed to the low-pressure turbine. The steam generator, condenser, feed water pumps and the de-aerator are of a commercial standard. The steam turbine-generator is sized to deliver high power during peak demand for electricity. The combined power of the top and bottom-end cycles is higher than what a single cycle plant would have delivered. The net result is the potential for the customer to specify the required capacity of the MS storage and related ST. This allows for the plant to be specified to meet the local needs, with capability to follow the overall demand profile as depicted in Fig. 3 and/or flexibly support intermittent renewable systems such as wind or solar. The classical power capacities for the concept are a nominal of 100 MW, which delivers 30 MWe from the gas turbine cycle and 70 MWe from the steam turbine at peak demands. The impact of the MS loop over a 24-hour period is variable, as the storage capacity is customer dependent. The profile in Fig. 3 shows a six hour MS storage capability. Fig. 4: Possible system layout. Fig. 4 provides a scale of reference for the MS storage system in relation to the reactor-helium turbine system. In principle, the latter system may very easily be integrated into the typical footprint of the plant shown in Fig. 4. The concept arrangement in Fig. 5 allows for the nuclear generation unit to be simpler than the PBMR and other similar designs. This is primarily because it has no main helium pipework and comes with a significantly compact footprint. This configuration would allow simplified maintenance, as the entire power conversion unit (PCU) could be replaced as a single module for refurbishment. 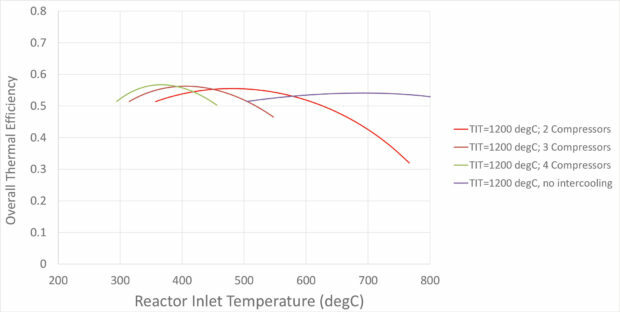 A parametric design was performed for the system (including molten salt storage) with the intent of determining the overall efficiency as a function of the number of compressors and the reactor inlet temperature. The results of the analysis are shown in Fig. 6 for a turbine inlet temperature of 1200ºC. The results indicate that the overall thermal efficiency increases as the number of compressors increases. To select the appropriate configuration, the reactor inlet temperature needs to be fixed. For illustrative purposes, if a reactor inlet temperature of 400ºC is selected, it is clear from Fig. 6 that three stage compressions would yield the greatest thermal efficiency. Generation IV economic models suggest that the SMRs are generally superior on safety, provide efficiency and price competitiveness with respect to other technologies. The review of the PBMR business case showed no fundamental weaknesses . All the AHTR work shows more efficient design with a lower capital cost and with flexibility of generation capability. Based on current knowledge, it is a reasonable expectation that the AHTR will penetrate the electricity market at highly competitive prices. The proof of concept machine performance targets are assumed to include at least: 50% efficiency, 90% load factor, a two-year construction schedule and a 40-year life span. Fig. 5: AHTR reactor unit in PCPV with PCU. A high level programme schedule for the development of the AHTR proof of concept is shown in Fig. 7. The initial phase entails comparative research investigations to establish a combination of feasible technological advances to achieve the desired functionality and performance. These ideas are evaluated through rigorous assessment techniques in collaboration with academic institutions, while test rigs for some less established concepts are used to validate the results. The work packages in 2016 focused on establishing the design concept within the areas of system modelling, fuel characterisation, physical design, licensing framework and pre-stressed concrete pressure vessel investigations. Meanwhile, the focus for the current year is on material qualification and developing the design concept further. The adopted approach is to ensure that once the research investigations achieve an acceptable level of maturity, the work is base lined and the engineering team initiates the applicable system development specifications, as an element of the design. The system design aspect for the proof of concept machine is expected to last for at least three years. Fig. 6: Efficiency vs reactor temperature for 1-4 compressors. It is envisaged that the construction of the AHTR shall not exceed two years. Thus, the proof of concept machine should be commissioned in the mid 2020s. Additional test runs for improved performance and the incorporation of new features before 2030. It is therefore conceivable that the AHTR programme could be commercially viable by the early 2030s. The guiding principle for the design is informed by future demand for electricity. This design can be built inland as it does not use water for cooling and can be built close to the load centre. The turnaround time from construction to commissioning is short (less than 24 months). It requires fewer staff to operate, refuelling outage durations are shorter and it will be easy to maintain. The plant is inherently safe and requires fewer safety systems than a conventional PWR, which results in lower build cost. A description of the concept design, funding structure and schedule for the PBMR project is discussed. A case is put forward for pursuing this technology to form part of the future electricity mix in South Africa. As it stands, there are numerous advantages and there is an impetus for South Africa to pursue this further to become world leaders in the technology. Furthermore the issues of clean energy (with low carbon emissions) is also addressed in a sustainable manner. Fig. 7: High Level Project Schedule. The authors recognise the contributions of the Department of Energy (DoE), as the implementing agent, in raising the research and development of the Generation IV reactors in international forums. Further acknowledgements are due to Eskom’s leaders for the review of the PBMR business case, resulting into the decision to restart the programme. The efforts of the AHTR engineering team in the development of this article are also highly appreciated. Department of Energy: “Draft IEP & IRP, Assumptions and Base Case Results”, 28 November 2016. DR Nicholls: “Advanced High Temperature Reactor Project – PBMR Relaunch”, African Utility Week, May 2017. Matshela Koko: “Memo to the Eskom Group Chief Executive on the relaunch of the PBMR Programme, March 2016. E Mulder and E Teuchert: “OTTO-PAP – An Alternative Option to the PBMR Fuelling Philosophy”, IAEA; TCM on HTGR Technology Development :“Commercialising the HTGR”, 13 to 15 November. Pebble Bed Modular Reactor, Business Case, CA 180-013358-A122, August 2002.